Hour 2 went well, after a minor technical glitch. 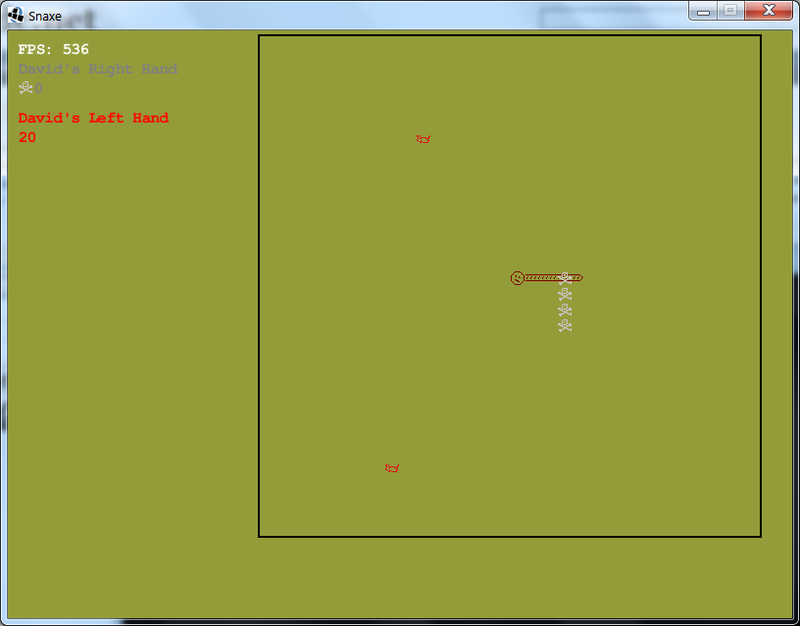 The game is now "fully playable", though I've slowed it down to test. Each snake is independently controlled, and has its own colour, name and score. Snakes no longer grow infinitely, they now only grow when they eat a rabbit (which also increases their score). Powerups and skulls decay after a while. When a snake dies, it turns into skulls for a while too. Rabbits are randomly placed every so often. Maybe skulls should be too. In this screenshot, my right hand's snake has run into the tail of my left hand. Next up: Speeding the game up as it progresses. A player queue for players waiting to join the next game. Sensible starting positions depending on the number of players.